Some of the best vocalists across all of music hail from gospel music. Gospel singers tend to have madd pipes that are clearly anointed by the spirit. Sure, not everyone is a believer and gospel music appeals to particular a niche, but what’s indisputable is the skill set of that the gospel musician possesses. Veteran, Grammy award-nominated gospel vocalist Kim Burrell exemplifies the prodigiously talented musician, period. Her instrument is an eclectic one that’s as attuned for its spiritual purposes as it is for jazz or soul. On A Different Place, Burrell’s first album in four years, Burrell’s extraordinary instrument has never sounded better. A Different Place was produced by Asaph Ward, and executive produced by Burrell and Jalene M. Mack. “Praise Groove” initiates A Different Place energetically, by all means serving as the catalyst for the praise that it’s title suggests. As setting the tone serving as an important benchmark for any artist, Burrell passes the test with flying colors. Follow-up “Thank You Jesus (That’s What He’s Done),” penned by gospel standout Myron Butler, arguably edges the opener, benefitting from its slick, modern production work. It’s not just the production work though. Though both message and lyrics are simple, Burrell’s delivery is undoubtedly authentic, chocked full of gratitude towards the Most High. “I’m Free Indeed” is angular and somewhat unstable, which just happens to make it one of the set’s most memorable and unique songs. Featuring a rap by “Bro Hahz,” this is not your mama’s gospel song and definitely not your grandma’s! Give credit where it’s deserved for stepping out of the box. A Different Place isn’t limited to the aforementioned standouts by any means. “I Worship” continues the adoration of God capably without miscue. Honestly, when has Kim Burrell missed a beat, better yet a note? “Falling In Love” embraces Burrell’s love of jazz but doesn’t do so anachronistically. “Falling In Love” still has its foot firmly planted in the contemporary gospel door, hence, separating itself from the traditions of the past but not completely breaking with them either. “Have Faith In Me (Mark 11:23)” is nothing short of stunning, with Burrell’s voice at its most lush and polished. Additionally the harmonic scheme of “Have Faith In Me” is gorgeous to the nth degree. Throughout the course of A Different Place, Kim Burrell connects on most of her shots – rarely does she miss if at all. Her best attribute is always her voice, which is clearly a ‘beast’ (in the most heavenly and spiritual way). The material doesn’t rewrite the gospel script but it isn’t expected to do so. This is Kim Burrell flexing her “firmly toned gospel biceps” and furthering her ministry through music. 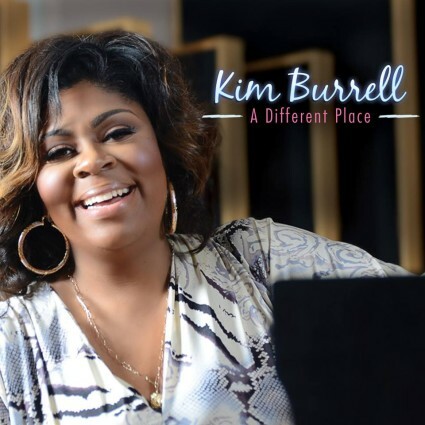 The contemporary tilt of the music may not rival Kirk Franklin’s progressive, genre bending interpretation on contemporary gospel, but Burrell keeps the music ripe. A winner? Definitely!